It can be tough to stay on top of airport security rules because they always seem to be changing. One minute you can keep your shoes on, the next you have to remove them; suddenly the TSA can see you naked and then they can't. It's hard to keep up. The extensive list of items banned or limited by the TSA (Transportation Security Administration) from being carried on airlines includes things you might not think twice about carrying on board. Read up on what you're not allowed to travel with because those airport security screeners will most likely find it. So, what isn't allowed? Sharp weapons are obvious no-no's, but things you may not even consider to be dangerous weapons can be found on the list like a combination nail clipper with a tiny file, for example. What else? Pepper spray, or bear spray, is something else you'll want to avoid packing in your bag, as are ice picks, and corkscrews. Blenders are allowed in carry-on bags if the blade has been removed. And no bowling pins because sports equipment that can be used as a bludgeon (such as bats and clubs) is prohibited. The same goes for canoe paddles and cast iron cookware. Plasma Lighters, electronic lighters, and e-Lighters are not permitted. The TSA-banned items in your carry-on can get you fined and even prosecuted, even if you packed them accidentally. In scenarios less common now than just after 9/11 airport security crackdowns, you could potentially wind up on a no-fly list or be unable to board if you are carrying a banned item in your carry-on. There are special rules for lithium batteries. Spare (uninstalled) lithium ion and lithium metal batteries must be carried in carry-on baggage only. When a carry-on bag is gate-checked or loaded plane-side, spare lithium batteries must be removed from the bag and kept with the passenger in the aircraft cabin. You'll need to ensure the terminals of the batteries don't touch if you are carrying multiple batteries. Solid food items (not liquids or gels) can be transported in either your carry-on or checked bags. Liquid or gel food items larger than 3.4 ounces are not allowed in carry-on bags and should be placed in your checked bags. 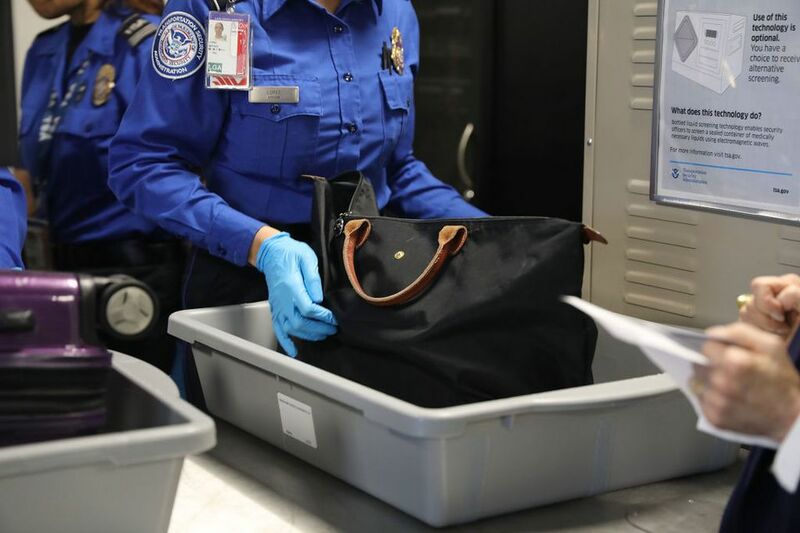 You'll be provided with a quart-sized bag when you arrive at security to place them in (or you can bring a small transparent bag from home) and then pass them through the security scanners in a separate tray to your bag or electronics. Pack items that are in containers larger than 3.4 ounces or 100 milliliters in checked baggage. And, if you are flying one of those airlines that says "wine flies for free," read the fine details. The liquid rules still apply. So you may not bring your bottle of wine in your carry-on, free or not. And, you must pack wine carefully in your suitcase or send it as baggage in a special wine travel box. It is those boxes that will not incur a baggage charge on designated airlines. If you are flying with live fish, for example, they can be in an enclosed, spill-proof, see-through container. TSA will inspect the bag or container. You'll be required to remove your laptop before passing through security, and in some cases, asked to remove all electronics from your bag to be scanned individually. You'll have to remove those when passing through security in the United States. It's not as common in other countries. Being a TSA Pre-Check passenger will save you time and often allows you through screening lines without removing as many pieces of clothing as in regular security lines. In September 2018, 94 percent of TSA Pre-Check passengers waited less than 5 minutes in line. Standard screening requires that you remove all items and place them on the X-ray belt for screening. With TSA Pre-Check, you don’t need to remove your shoes, laptops, liquids, belts and light jackets. Of course with any TSA screening, the rules can change, even on a particular day. There is a charge to be evaluated for TSA Pre-Check and you can apply online. Services at some airports can now mail banned items home for you at a cost of about $14—they're located near airport security in some airports if you find yourself accidentally carrying a banned item. If you actually go through security with a no-no and your bag is searched and a banned item subsequently found, the TSA screener will decide whether you're allowed to exit security and make arrangements for mailing it home. Current TSA rules are causing many travelers to check baggage to avoid facing extra hassle at security. Just in case, it's worth learning about how to avoid lost luggage—this article covers what to do if it happens. Learning how to pack for airport security is quite a pain, but it's gotta be done. Reading airport security packing tips will help prepare you and save time. What Kind of Food Are You Allowed to Bring on an Airplane? Can You Take Prescription Drugs Through Airport Security? How Does the Electronics Ban Affect International Travelers? Can I Carry Liquids in My Checked Bag When I Fly?